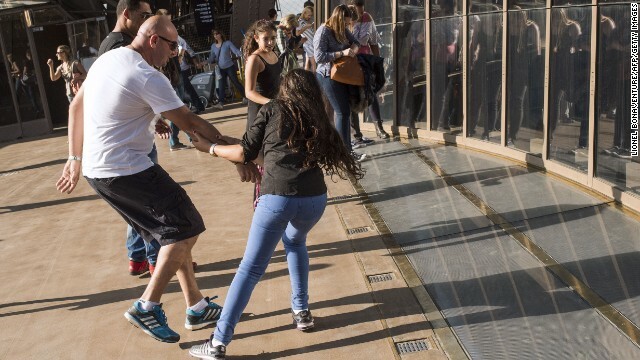 Visitors are lining up -- and lying down -- to experience the Eiffel Tower's new glass floor. The floor is part of a $38 million refurbishment of the Tower's first floor. 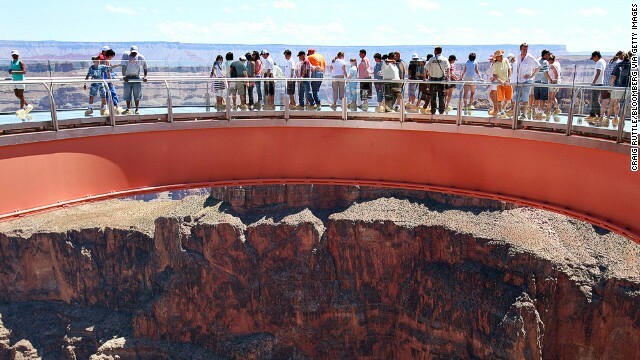 The glass floor looks down on the 57-meter drop to the ground beneath. It's hoped the refurbishment, which includes shops and a museum, will encourage some of the Tower's 7 million annual visitors to linger on the first floor. 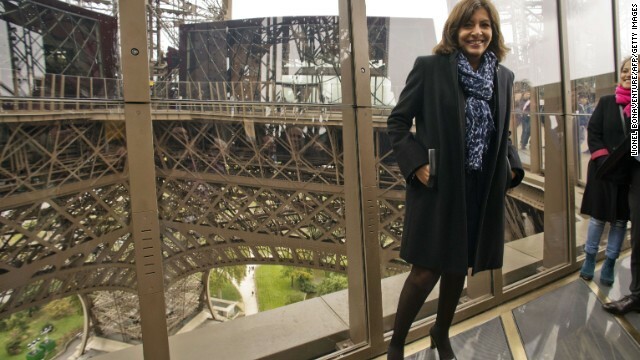 Paris Mayor Anne Hidalgo says the new floor proves Parisians can re-invent their city "without ruining its history." 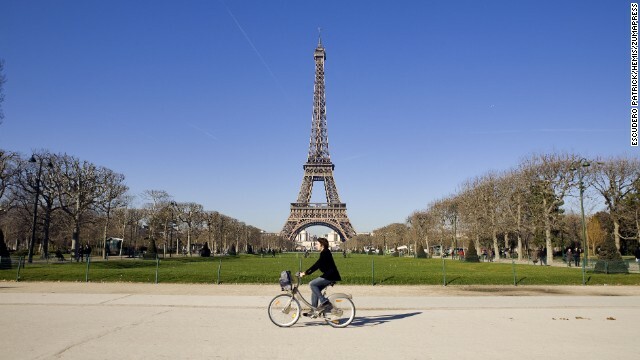 The Eiffel Tower marked its 125th year in 2014. Not bad for something that was supposed to be a temporary attraction. 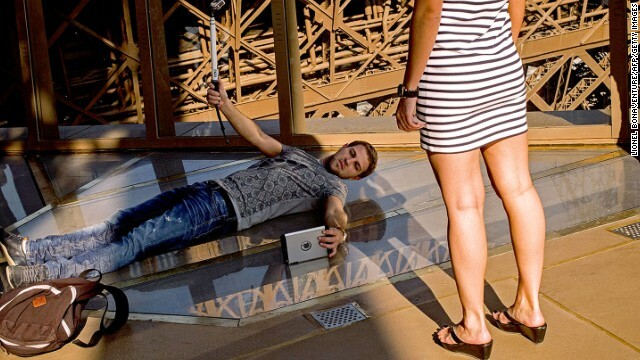 The Eiffel Tower's glass floor isn't the only transparent walkway. 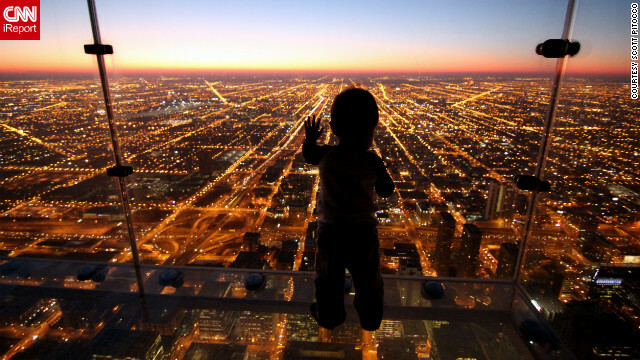 Chicago's Skydeck looks down from the 99th story of the Willis Tower. 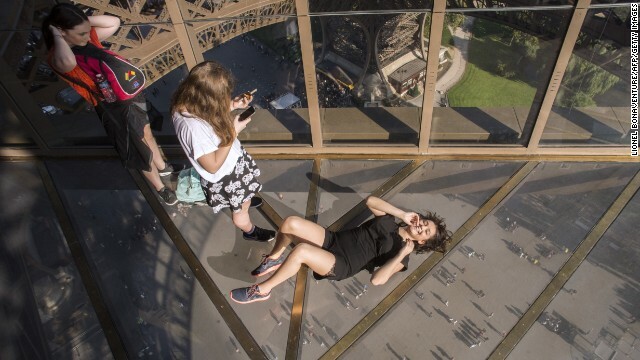 (CNN) -- It's known as the City of Light, but Paris has taken a dizzying step toward being the City of Fright after the Eiffel Tower unveiled a new glass floor. 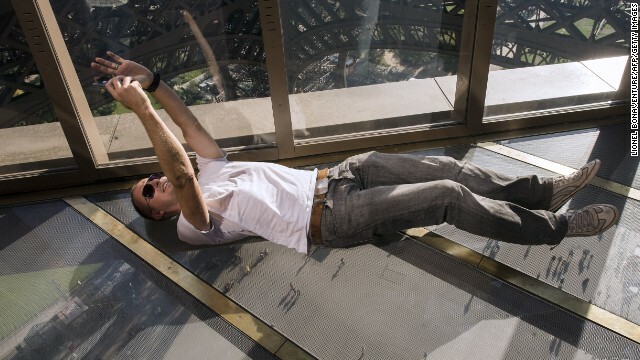 Offering dramatic views of the 57-meter (187-foot) drop from the 125-year-old landmark's first level, the transparent walkway has proved a hit with visitors lining up -- and lying down -- to take selfies. 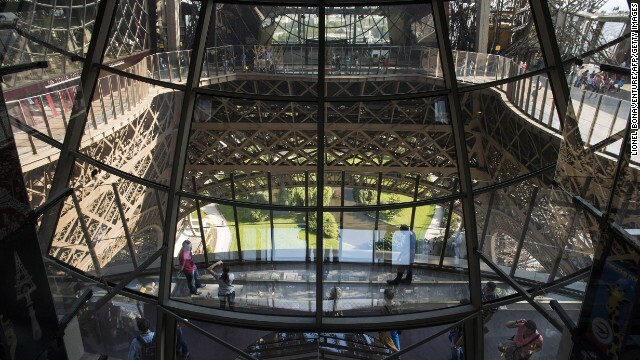 Paris's mayor, Anne Hidalgo, opened the new attraction, saying it would help bring back some magic to a city that's been criticized for disappointing foreign visitors. "I hear that Paris has lost its shine and attractiveness," she said. "It's not true." The new floor, she added, proved Parisians could reinvent their city "without ruining our history." It's the latest in a series of glass floored walkways to open in prominent destinations around the world. These include Chicago's Willis Tower Skydeck and the Grand Canyon Skywalk. Hidalgo celebrated the opening with a series of multilingual tweets inviting tourists to "enjoy this breathtakingly high experience." The glass floor is part of a $38.4 million renovation of the tower's first floor that also includes shops, restaurants and a museum. New outward-curving safety barriers also allow better views over the city. Until now, the tower's somewhat gloomy "premier etage" has been one of its least-visited areas, with most of its 7 million annual visitors heading straight to higher levels. The Eiffel Tower was built 125 years ago for the Universal Exposition, celebrating the centenary of the French Revolution. The famous Paris landmark, seen here in 2009, was also built as a tribute to French industry and science. 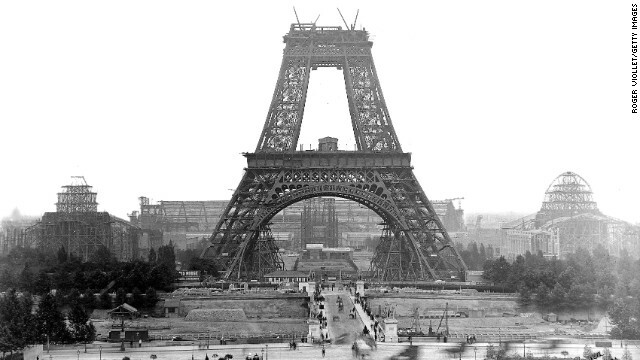 The tower, as seen during construction in 1888. There were 121 men who worked on the construction site. 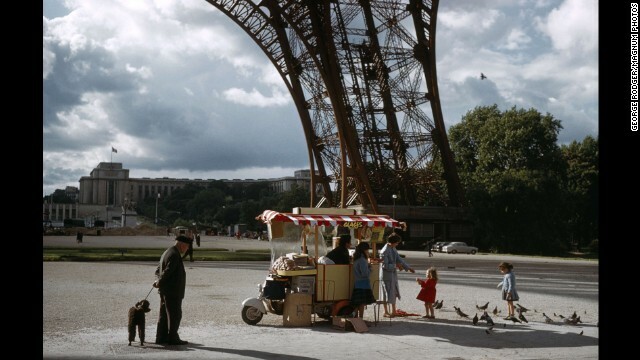 A cart sells refreshments underneath the Eiffel Tower in 1961. 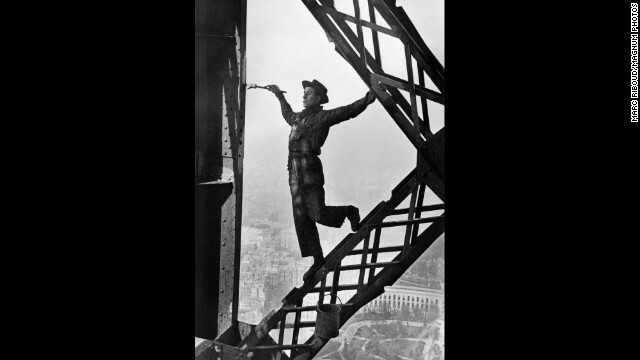 A man named Zazou paints the Eiffel Tower in 1953. The tower is repainted every seven years, necessitating 60 metric tons of paint. 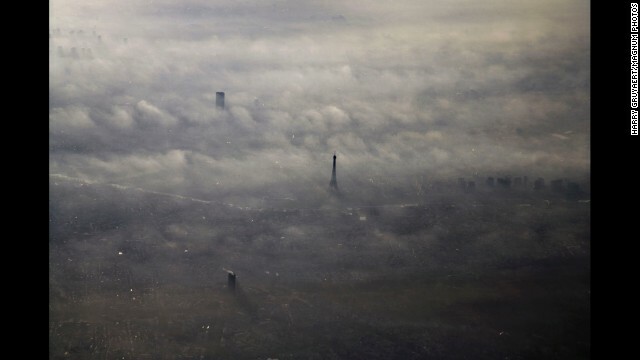 The Eiffel Tower peeks above the morning fog in 2005. 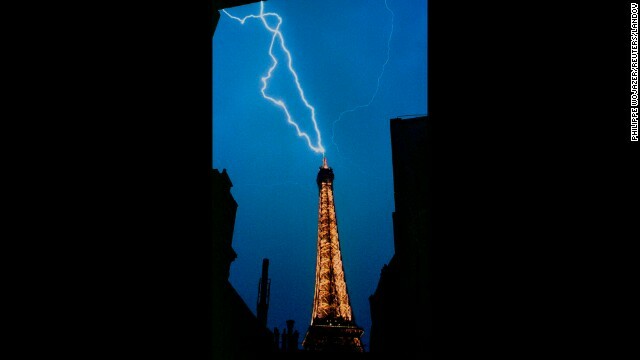 A lightning bolt strikes the top of the Eiffel Tower during a thunderstorm in 1992. The sun shines through the tower's ironwork in 1987. 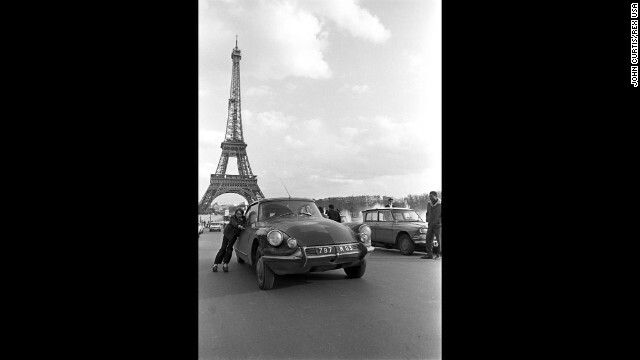 Children roller-skate on the streets of Paris in 1970. 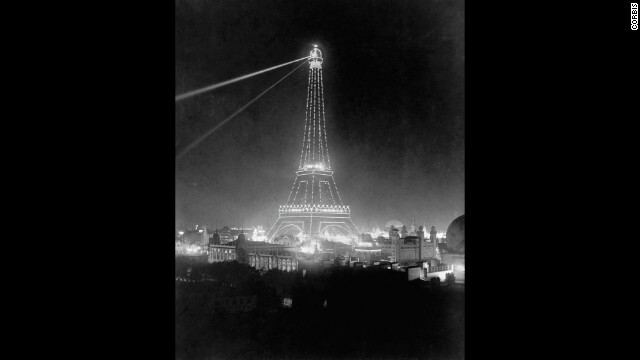 Spotlights illuminate the Eiffel Tower during the 1900 Universal Exposition. 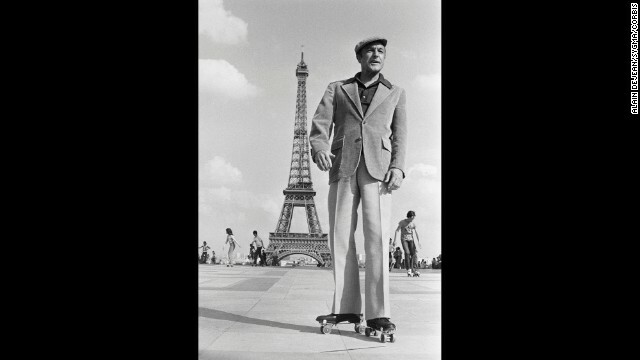 Gene Kelly wears roller skates in Paris while shooting scenes for "That's Entertainment, Part II." 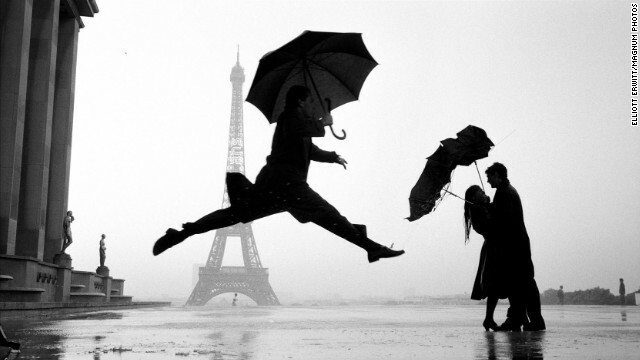 The tower on a rainy Paris day in 1989. 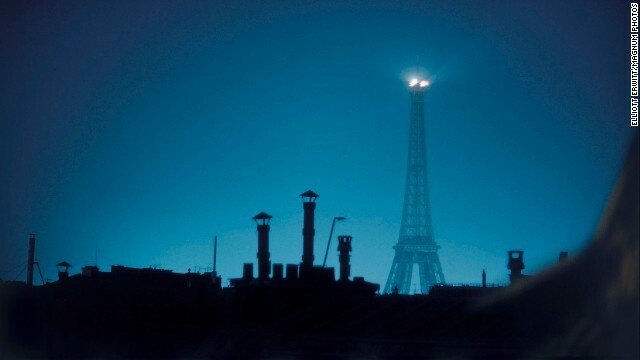 The Eiffel Tower is seen above Parisian rooftops in 1959. 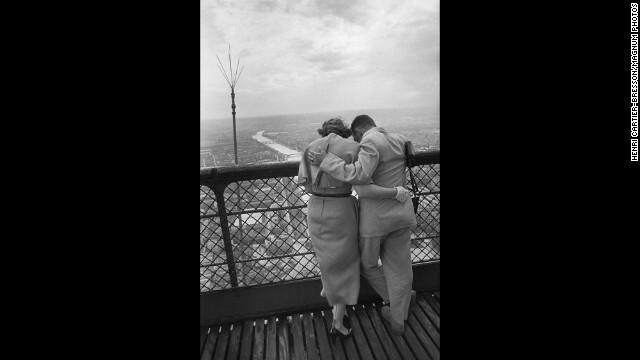 A couple enjoys the view from the Eiffel Tower in 1952. More than 250 million visitors have been to the tower since its construction in 1889. 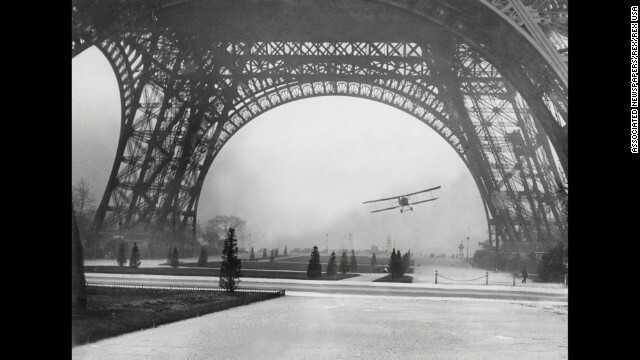 Leon Collet, a French airman, was killed in 1926 after flying through the base of the Eiffel Tower. His plane crashed and burned after colliding with cables from a radio antenna. 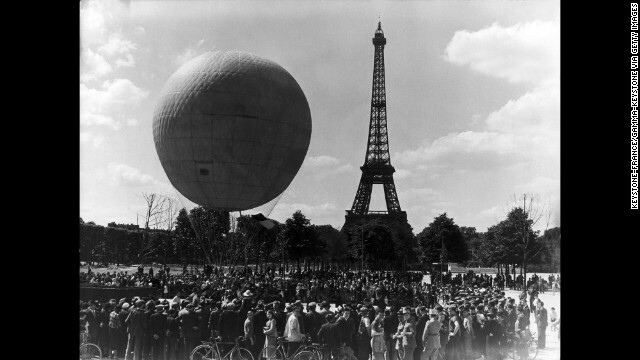 Crowds gather in 1939 to celebrate the 50th anniversary of the Eiffel Tower. 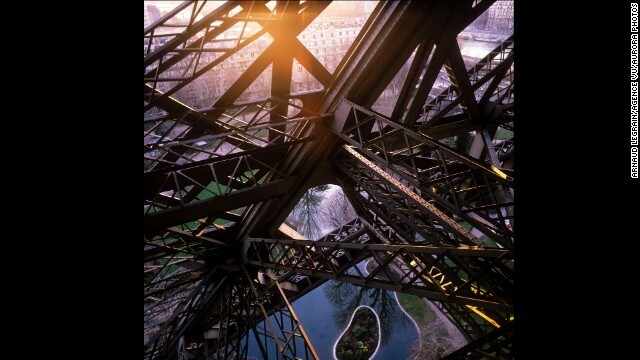 Built by Gustave Eiffel, the Tower was completed in 1889 as part of a "Universal Exposition" celebrating the centenary of the French Revolution. At 312 meters, it was the tallest building in the world until New York's Chrysler building overtook it in 1930. It was originally designed as a temporary attraction, but the decision was made to keep it as a permanent attraction -- and the Tower has never looked back. Thanks to the glass floor though, it can now look down.